Are you wishing you had super powers to help you handle all those office calls? Then add the GXP2160 to your utility belt. We’ll cut to the chase – there’s a LOT of buttons on this phone. We’ve counted them for you – 24 Presence Indicator/Speed Dial keys! If you’ve read our recent post on Presence, you already know the value of these keys. You’ll see at a glance which of your network phones are busy and which ones are available. AND you’ll be able to transfer calls quickly and easily with the push of a button. The phone also has 5 programmable soft keys to make your even MORE efficient. The other thing you’ll notice immediately is the big 4.3-inch colour display. Add your logo as a wallpaper and it’ll make a real statement on any desk. It’s also easy-on-the-eyes. No super-vision required! There’s many more features under the hood, including dual Gigabit ports, support for up to 6 lines, and 5-way voice conferencing. There’s Electronic Hook Switch support for Plantronics headsets and built-in Bluetooth for Bluetooth headsets and phone pairing. And there’s even a built-in USB port. 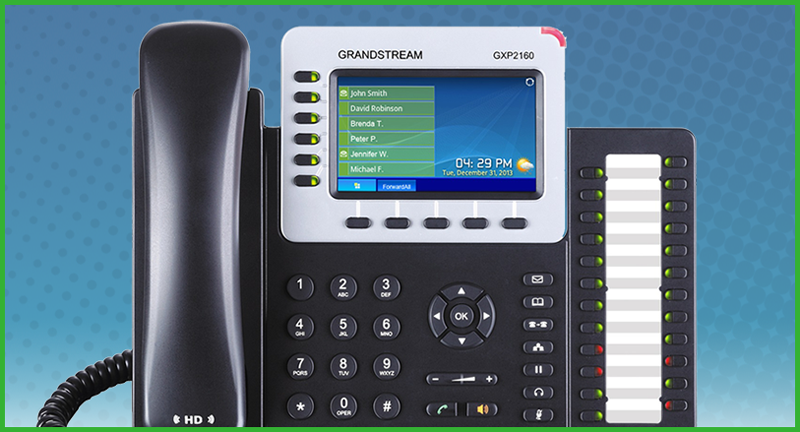 If you’re an Enterprise customer overwhelmed by heavy call loads, the Grandstream GXP2160 might be the perfect phone to save the day.